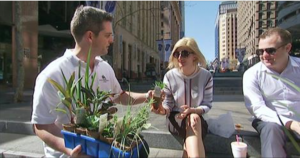 The episode starts with Matthew Carroll (NGIA) and host Costa Georgiadis handing out plants to office workers in Sydney’s Martin Place and calling on them to improve their Plant/Life Balance. The program featured many wonderful segments covering mental health and wellbeing benefits of plants and gardening that support not only Plant/Life Balance, but also More Trees Please and 202020Vision. Watch the episode in full on iView HERE.